The emerald ash borer, an invasive beetle that is killing ash trees in North America, is here to stay. As the beetle sweeps across the landscape, vast areas of dead ash are left in its wake in rural and urban environments alike. Optimism that biological control will become an effective tool in managing the beetle is increasing with research confirming that biological control agents are establishing at release sites in several States. Forest Service scientists are working closely with other researchers, land managers, and citizen scientists to expand the U.S. Department of Agriculture, Interagency Emerald Ash Borer Biological Control Program. Biological control of emerald ash borer involves the release of small, highly specialized wasps, or parasitoids, that seek and destroy the beetle's eggs or larvae in ash trees. Since Forest Service and Animal and Plant Health Inspection Service scientists in Michigan released the first parasitoids in 2007, the Emerald Ash Borer Biological Control Program has expanded to 15 States through 2012. 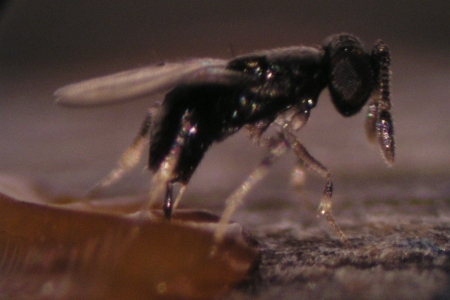 During this time, Forest Service scientists and Federal, State, and university collaborators have been working to develop nondestructive methods to determine parasitoid establishment in ash trees. This work is paying off, and parasitoid establishment is now confirmed at release sites in Illinois, Indiana, Maryland, Michigan, Ohio, and Pennsylvania. Forest Service scientists also began collecting data at field sites in Michigan to assess the long-term effects of emerald ash borer biological control on ash health and regeneration.